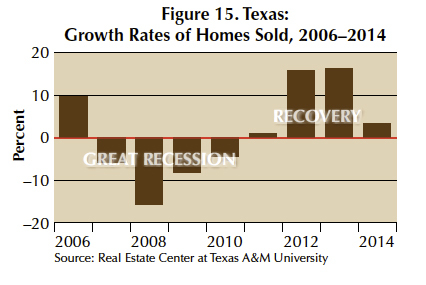 Texas had a sharp fall in home sales in the 2007–09 Great Recession (GR). 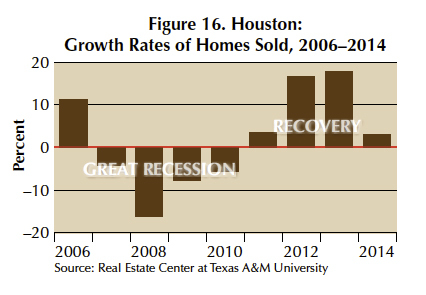 Since 2011, the recovery of the state's economy from the GR has boosted the number of homes sold in Texas. 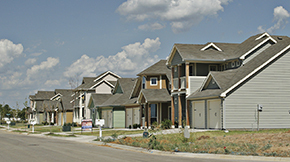 Researchers at the Real Estate Center at Texas A&M University studied the contributions of Texas' regions to the state's home sales recovery. They found that the Houston and Dallas metro areas made the largest contributions to Texas' total home sales recovery in 2012 and 2013 followed by Austin, San Antonio and smaller metro areas. The research also found that after two years of exceptionally strong home sales expansion in 2012 and 2013, the state's home sales market recorded much slower and more moderate growth rate in 2014. 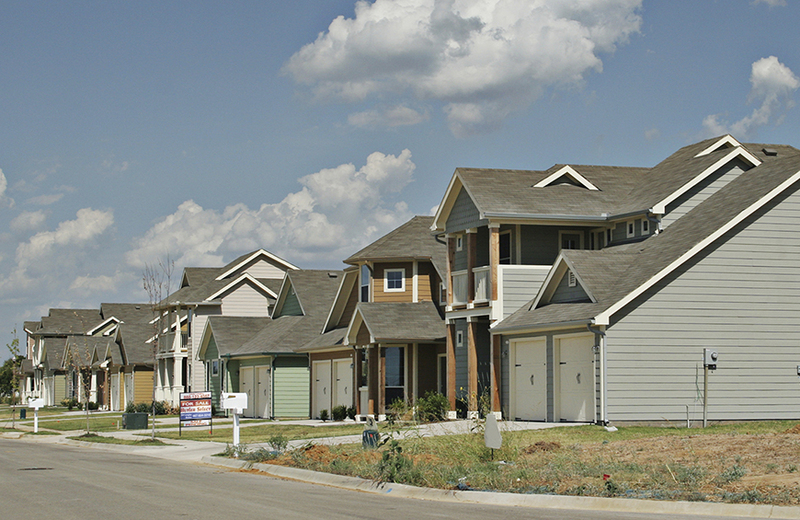 The Texas housing market comprises regional housing markets in 26 metropolitan areas and 43 micropolitan areas. Not surprisingly, the state's housing market is concentrated in the five major metro areas of Austin, Dallas, Fort Worth, Houston, and San Antonio. 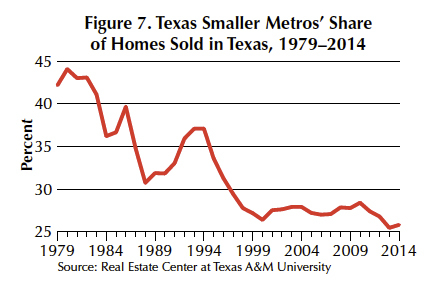 The market share of homes sold in Texas accounted for by these major metros increased from 57.8 percent in 1979 to more than 70 percent in 1997, and since then has remained relatively stable at around 73 percent (Figure 1). 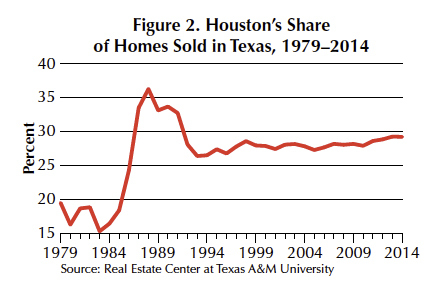 Houston is the largest regional housing market in Texas with a relatively stable share of around 27 percent of total Texas homes sold since 1997 (Figure 2). 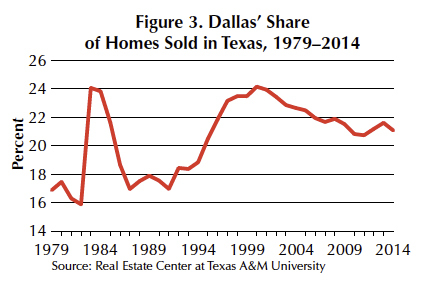 Dallas' share of Texas homes sold has trended downward since hitting an all-time high of 24.1 percent in 2000. It was the second largest housing market in the state, accounting for 21.1 percent of homes sold in 2014 (Figure 3). 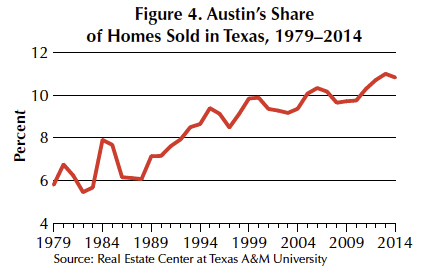 Austin's share of homes sold has trended upward from 5.8 percent in 1979 to 10.8 percent in 2014, making it the state's third largest housing market (Figure 4). 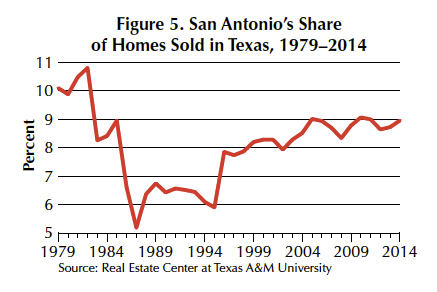 San Antonio is the fourth largest, with its share of homes sold trending upward since 1997 and reaching 9 percent in 2014 (Figure 5). 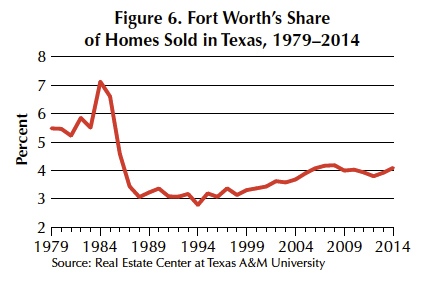 Fort Worth's share has slowly trended upward from 3.2 percent in 1998 to 4.2 percent in 2014 (Figure 6). ​The expansion of housing market shares of the state's larger metro areas has been at the expense of the smaller regional housing markets. 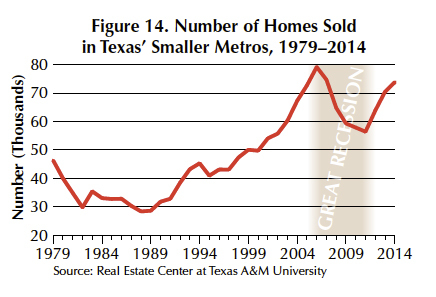 The percentage of Texas homes sold accounted for by the state's smaller metro areas has trended downward from 44.1 percent in 1980 to 25.8 percent in 2014 (Figure 7). 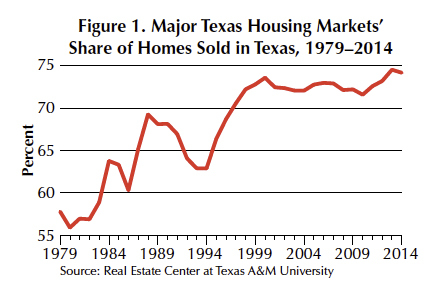 Texas did not experience a home price bubble during the GR because of flexibility in the supply side of the state's housing markets and abundant lands for new home construction. In the early 2000s, the state's housing market responded to increased low-cost mortgage lending by building more housing units, unlike California's and New York's housing markets in which more credit availability coupled with limited supply led to higher home prices. When the housing bubble burst in the GR, the other states' housing markets suffered both in the number of homes sold and prices. Because they account for more than 70 percent of Texas home sales, the five major metro areas bore the brunt of the housing crisis in the GR. 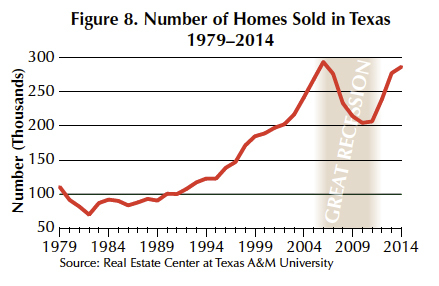 Total number of homes sold in Texas fell from a pre-GR peak of 292,805 units in 2006 to 203,637 units in the trough year of 2010, a decline rate of 30.4 percent spread over four years (Table 1 and Figure 8). The home sales decline rates from 2006 to 2010 for Houston, Dallas, Austin, and San Antonio were 29.9 percent, 34 percent, 34.4 percent, and 29.5 percent respectively (Table 1 and Figures 9 to 12). 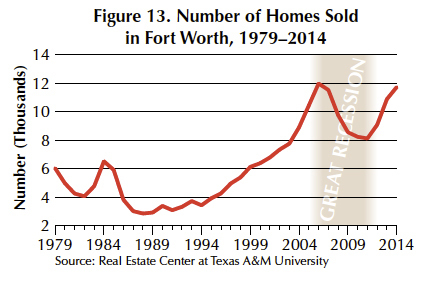 Fort Worth suffered five years of home sales declines from 11,977 units in 2006 to 8,124 units in 2011, a decline rate of 32.2 percent (Table 1 and Figure 13). The state's smaller metro areas collectively did slightly better than major metros. The number of homes sold in those areas fell from 79,155 units in 2006 to 56,436 units in 2011, a decline rate of 28.7 percent (Table 1 and Figure 14). 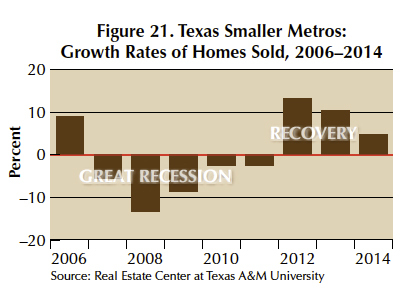 After four years of declines, Texas home sales began a weak recovery in 2011 (Figure 15). 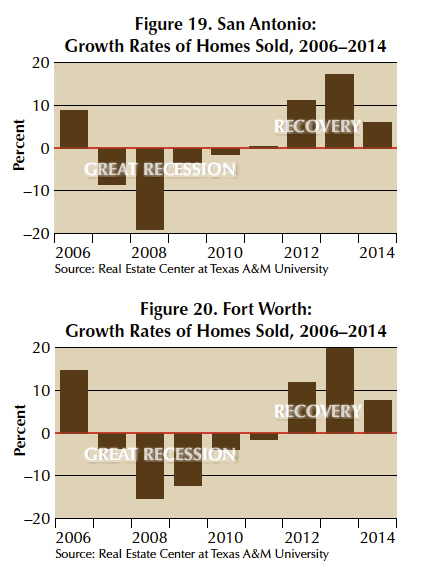 The regional housing markets of Houston, Dallas, Austin, and San Antonio began recovering in 2011 while in Fort Worth and the state's smaller metro areas, recovery started in 2012 (Figures 16 to 21). 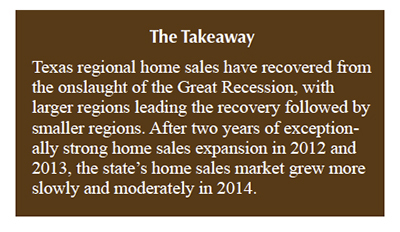 The home sales recovery in 2011 was not strong in the state's major regional housing markets. The growth rates of number of homes sold in Houston, Dallas, Austin, and San Antonio were 3.6 percent, 0.6 percent, 6.7 percent and 0.3 percent, respectively. The state's local housing markets had stronger home sales recoveries in 2012 and 2013, reflected in double-digit growth rates (Figures 16 to 21). After two years of strong growth rates in home sales, housing markets weakened at the end of 2013. As of the end of 2014, only Houston and Austin had recovered their pre-GR levels in number of homes sold, but the latest data for 2015 show the state and all its local markets are expected to recover their pre-GR levels of home sales when the 2015 year-end tally is taken. Growth rates of Texas homes sold in any designated period is the weighted average of the growth rates of number of homes sold in the state's local housing markets. Weights are the shares of homes sold in local markets. Each region's contribution to the statewide growth rates of homes sold is equal to the growth rate of homes sold in the region multiplied by that region's share of homes sold in Texas. Houston and Dallas made the largest contributions to the growth rate of number of homes sold in Texas in 2012 and 2013, followed by smaller metro areas and Austin, San Antonio, and Fort Worth (Table 2). 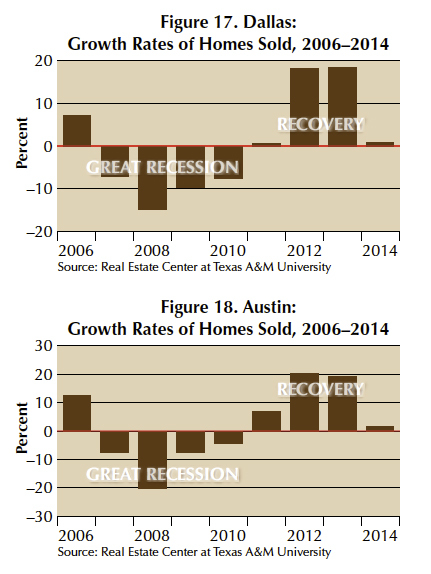 The state's housing markets recovered lost ground but are currently cooling. The growth rate of number of homes sold in 2014 has fallen to a moderate rate of 3.32 percent because of smaller contributions from the state's major metro areas. Houston's economy was a major driver of the state's economic recovery from the GR but is beginning to show the impact of lower oil prices and drilling activity. Consequently, Houston is expected to make a somewhat smaller contribution to the state's total home sales for 2015 and especially in 2016. The growth rate of Texas home sales in the next couple of years will depend more on the contributions of Dallas, Austin, and San Antonio.